I’m coming up on my 1-year anniversary as a writer and blogger, and as I’ve worked out all the techie-stuff that ate up most of my time in the first few months, I’ve had more time to devote to reading amazing ideas other bloggers share daily around the web. I expect you don’t have as much time to hunt down great natural remedies and real food recipes, so if you want to see my favorite finds, follow me on Pinterest, where I post terrific ideas from other green bloggers several times a day. This month I’ve been investigating all sorts of interesting medicinal herbs that we can use to help us feel better everyday. From simple teas to help unwind to an interesting class of herbs called adaptogens, I’ve been experimenting with natural remedies that help me deal better with stress, support my immune system, help me sleep better and boost my energy level. The experiment seems to be working. I’ll give details in a future post. I’ve been discovering still more uses for the plants I find in my yard. I learned this season that even creeping Charlie may have some redeeming qualities as an edible or tea ingredient (as do a number of awesome “weeds” — find out more here.) I was delighted when I learned that bee balm could be added to the list of herbal remedies growing in my yard. Sarah at Thyme to Embrace Herbs explains 6 medicinal uses for bee balm. More about growing, harvesting, and uses in this post from the Herbal Academy. I’ve got bee balm growing all over the place because it’s not only beautiful and drought-tolerant, it’s great for our endangered pollinators. It naturalizes well and has been helping to fill in the places where I smothered our last remaining patches of grass. Oh, and it smells WONDERFUL when you walk by. It makes a lovely tea, especially if you’re an Earl Grey fan like I am. Do you long to grow more food in your yard? You’ve probably got places to put it you haven’t thought of yet. One of my most shared posts to date appeared this month on Eartheasy — go check out my primer on edible landscaping if you want to know more. Not only our yard, but our local farms are waking up also. We’re counting down till our first CSA pickup, when all the great local food really starts rolling in. I went to our first farmers’ market of the season last week. It’s still really early in the season here in Minnesota, so there wasn’t much besides greens and plants, but I’m just happy to see our hardworking farmers back in their spots at the market. I enjoyed reading about 5 Happy Habits for Shopping the Farmers Market by Kris at Growing Wild Roots, who gives advice about being a pleasant shopper at the farmers’ market from the perspective of the farmer. Go show your farmers some love when you pick out some delicious fresh veggies for dinner! I’m always a fan of simple ways to make food and drink more nutritious and satisfying. With summer coming, keeping hydrated is a priority. Anya at Prepare and Nourish has 12 delicious recipes for infusing water with lovely summer flavors. I’ve been pinning tons of recipes from Meghan at Whole Natural Life. As the weather warms and summer approaches, I want to try some of her amazing dairy-free ice cream recipes, like this one for chocolate cashew milk ice cream. I have an ice cream maker I got as a present over a year ago, and I think it’s time to give it a try! We’ve been going through yogurt for smoothies like crazy around here, so I’m also looking in getting some kefir grains so I can try Meghan’s recipe for making my own kefir. What were the highlights of your month? What are your favorite finds around the web, in the garden, or in the herbs section of your natural foods store? Leave a comment! 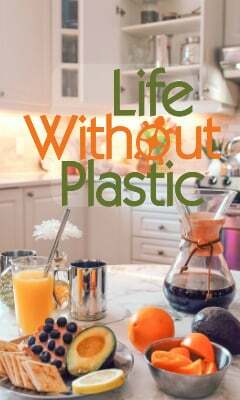 I share inspiring ideas for healthy food, gardening, and natural remedies from across the blogosphere several times a day. Follow me on Pinterest to see more awesome finds from other great green bloggers! « Foods That Help You Sleep Better! It’s really been wonderful learning about all these new ways to support our health; so amazing that reading and writing about things like this is my JOB now! Looking forward to more experiments prompted by all the great green and crunchy folk I’m reading and “meeting” online, like yourself! Oh the world wide web is such a big place…and yet it seems we keep bumping into the same like-minded people! I have read several of the posts you mention, including your great edible landscaping piece on Earth Easy! Thanks for the links Susannah. Looking forward to reading more of your great articles! Thanks for reading Michelle! I’m eager to see more of your work as well 🙂 Really enjoying experimenting with the herbs you recommend in your post! There are so many great ideas here. I love to find great tips and tricks by reading other bloggers. 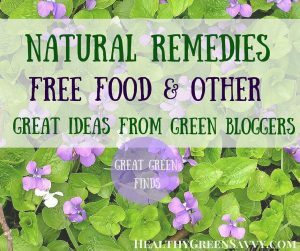 I am so delighted that you shared these cool and creative Great Green Finds: Natural Remedies, Free Food, and More Goodies from the Blogosphere with us at the Healthy Happy Green Natural Party! I’m Pinning and sharing this!